Naruto 610 was recently released and man that was awesome! The Juubi looks menacing, it’s pure monster. It’s bigger than Kurama or Hachibi. 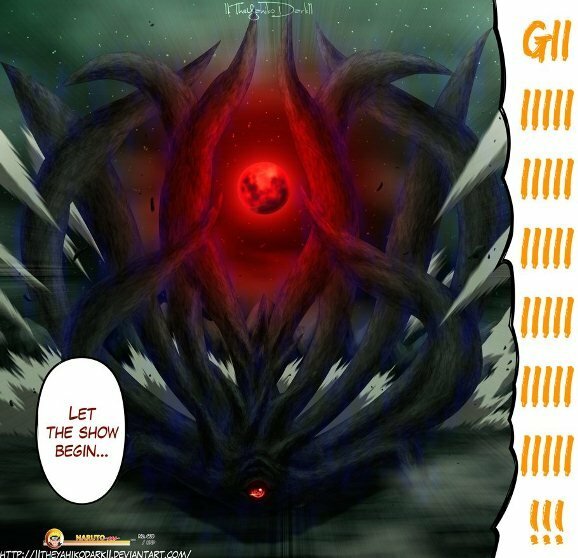 The fighting scene between the Juubi, Eight and Nine tails were epic. Unfortunately the excitement lasted only for a short time since Kishi decided to end the chapter quick also. Read the rest of my Naruto 610 review below. WARNING: Heavy spoilers ahead. If you haven’t read the chapter and don’t want to get spoiled, I suggest you read the chapter first. The Juubi was unexpectedly released during the previous chapter, and it was on a rampage. The Juubi has a huge protruding eye on the middle, and huge mouth with razor sharp teeth. It’s just pure monster, more horrifying than any of the tailed beasts. Madara and Obito was just standing comfortably on top of its head, just watching and waiting for what Naruto and his team would do. Kurama explained that the Juubi doesn’t have feelings or ideals like the other tailed beasts. It can’t be sensed and it’s composed of the same energy circulating the planet. Naruto tries to sense and measure the Juubi’s power but just like Kurama said, it can’t be measured. Kurama made the first strike but the Juubi just hit him back really hard just with one blow. Kurama and Hachibi then tries to attack it with continuous Bijuudama but it didn’t work at all. The Juubi just threw it back at them. But Naruto and Kakashi made an unexpected move, a surprise attack. While the Juubi attacked Hachibi and Kurama with a Bijuudama, Kakashi used Kamui on Hachibi to transport him right on top of the Juubi’s eye to release a surprise Bijuudama attack. And just when I was about the fell from my chair, the chapter ended! Honestly, it has been a while since we last saw an epic battle from Naruto manga, and Naruto chapter 610 just showed us another one. But I am not sure if Hachibi’s attack will somehow damage the Juubi. My prediction would be their attack will only be deflected or dodged. Either by the Juubi itself, or Madara and Tobi who are just standing right on top of its head. Naruto and his team will surely face a much greater challenge on the following chapters. I’m just curious when and how will Sasuke shows up in the middle of this war. What will Sasuke’s contribution be? And will Naruto and Sasuke team up to defeat Madara? Right now only Kishi knows the answer to these questions.